12 Bacon Dishes You Need To Try! There’s no doubt about it; bacon makes the world go around. And, whether you’d like to admit it or not, you’re probably a bacon fan too. Bacon is delicious, to say the least. It’s mouth-watering, crispy, greasy, satisfying and has the best intentions of getting us out of bed bright and early. Truly, if there is one thing that America proves to love time and time again, it’s that there will always be a market for bacon. It may as well be America’s culinary mascot. 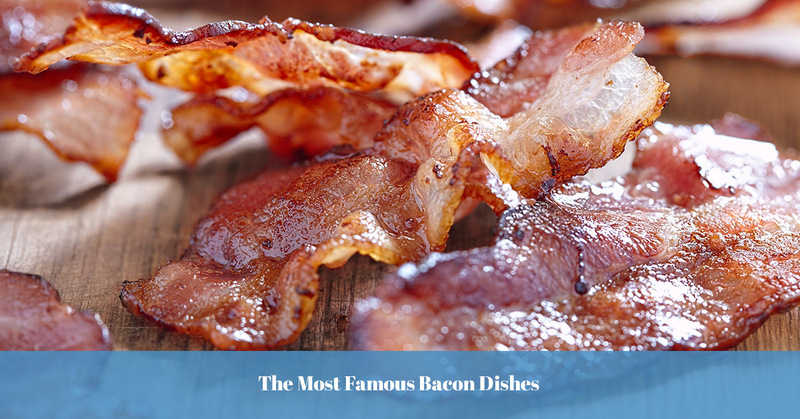 Because bacon has made its mark, there are plenty of American restaurants that choose to serve at least one, if not two, remarkable bacon dishes. We love bacon as much as you do, and we’re sure you have some favorites out there that are more than delectable. Does this sound about right? Here are some more yummy dishes in which the main ingredient is bacon. Who doesn’t love dates and meatballs wrapped in bacon that has been deep-fried? This 16-strip slab of meat is 2 pounds, deep-fried followed by 3 hours of relaxation in the smoker. This log of bacon, ground beef and pork is prepared and sliced up to make the best sandwiches around. America loves donuts; America loves bacon; why not connect the two? At Hypnotic Donuts, they do! The Mount Saint Hell Yeah features a bacon topped cinnamon roll to make all of your dreams become a reality. Who doesn’t love a cheesy, greasy pizza? We know we do! At Bar Centra, they make their pizza even better by topping it off with eggs, provolone, pancetta and a sauce made from pure bacon juice. It may not be the healthiest choice, but everything in moderation is OK, right? One of the most popular bars in Nashville has one of the most popular drinks desired by visitors and locals, the Bacon Old Fashioned. It’s important to remember bacon doesn’t always need to be chewed to be enjoyed. The Bacon Old Fashioned is made with bacon-infused bourbon, coffee pecan bitters and maple syrup. Yes, this restaurant’s name is Bacon. It opened in the heart of Austin, TX in 2011 and it features select swine dishes bacon consumers love, such as the Chicken & Waffles with Bacon. The mountain of food features thick chunks of bacon, bacon infused batter used during the baking, fried chicken and waffles. A BLT is a popular sandwich, but this one… this one…is one you’ll want to enjoy time and time again. The 1lb BLT features everything a normal BLT comes with, except it has an entire pound of bacon. That’s right, the best part about a BLT just got a little better. This BLT is simply legendary. When was the last time you had bacon on your nachos? We guess never. At Harry’s Bar & Grill you’re lucky because you get to enjoy the best of both worlds: Nachos and bacon! Instead of topping your nachos off with ground beef, try consuming a bit more pork and top off your nachos with bacon. Plus, the “chips” in these Irish nachos are waffle fries. What’s better than a waffle fries and bacon combination? Not much. Sometimes the best meal you can have is a plain-Jane burger. At Lake Park Restaurant, we serve burgers of different sorts, including the Western Burger which is topped with melted cheddar cheese, greasy bacon strips and crispy onion rings smothered in BBQ sauce. When you order the Western Burger at our American restaurant, you’ll be keeping it simple while getting the powerful flavors you crave. Can you say “bacon explosion?” That’s what this mouth-watering bacon-weaved and -wrapped sausage loaf is all about. Plus, it’s stuffed with bacon too! What could be better? Maybe some maple syrup smothering it which is exactly what this American restaurant does. The only other toppings it needs is some melted cheddar and a poached egg, and that’s included too. If you’re searching for a late-night American restaurant, Crif Dogs is a perfect choice for bacon lovers. Order The Spicy Red Neck and receive a hot dog that’s wrapped in bacon and topped with cole slaw, chili and jalapenos. No other weiner is better than this mastery of pork served at a price that’s right. Who doesn’t love meatloaf? Who doesn’t love bacon? Who doesn’t love beer? Two of your favorite foods and your drink of choice are now available in one mouth-watering dish, the mouth-watering Bacon-Wrapped Meatloaf with Beer Gravy. Enjoy this snack with a side of bacon-chive mashed potatoes and feel as though you’re in heaven. If you love chicken-fried steak, you may as well give the chicken-fried bacon a try, especially if you’re a bacon lover. Chicken-fried bacon is hands down, the most American food you can eat, end of discussion. It’s truly a perfected food; give it a shot the next time you find yourself wandering around Snook. Bacon is a delicacy, well, it should be seen as one. If you’d like to eat more bacon, it’s time you visit Lake Park Restaurant in Hobart. We mentioned our famous Western Burger with a heaping pile of bacon but we have more options for you to try. Stop by our American restaurant today and eat some bacon; you know you want to!